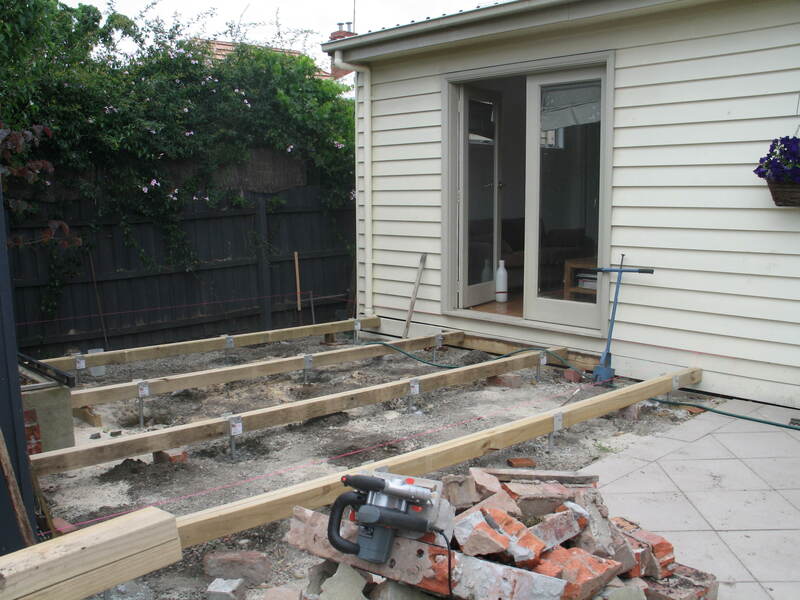 Before and after – garden transformation | Hey Bernice! We decided to replace the grass and stones with paving, which called for a concrete slab. It wasn’t necessary to pave on a slab, but if the next owners wanted to drive their car across the paving to the garage, it would overcome a lot of movement and cracking of the pavers down the track. So in rolled the bob-cat, and cement truck, and for about a week we followed the Greek tradition with the majority of our back yard concreted! I was very particular about the paving pattern. I wanted it on the diagonal from the house, with a half tile border – to create a little interest, and give the space a courtyard feel. Once the paving was complete it was time to focus on the deck. 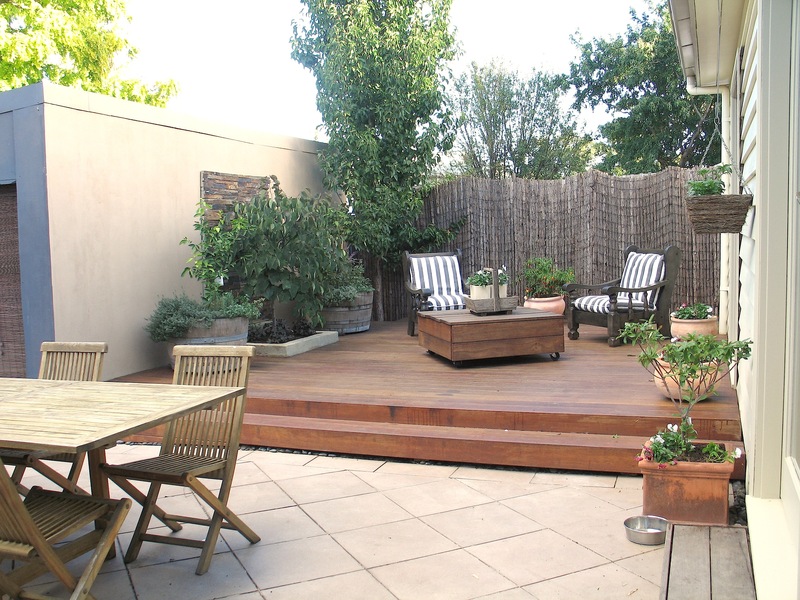 I wanted the deck to feel like an extension of the house, so we chose wide Merbau wood (the same width as the interior floorboards), and ran the wood in the same direction as the interior floorboards. The deck is at the same height as inside, and we built a step the entire length of the deck, to improve traffic flow down to the paving, and overcome any falls off the deck to the paving (especially after consumption of my husbands home brew!). My builder husband (who wants it made very clear that he built the deck with the help of his dad) decided to use screws for the deck, which is more time consuming (you have to drill the hole, countersink it, and then drill the screw in – for every hole you have 3 steps!). The benefits are that the boards are less likely to lift, the heads of the nails don’t pop up, and it looks a lot neater. Once the deck and paving were complete we needed to seal both. The paving with a water based sealer (rolled on), and a water based decking stain (we chose the merbau colour). Along the fence – we planted 3 Ornamental Pear trees (Cleveland Select). These will eventually join together and grow about 10m tall and 5m wide providing plenty of privacy from the neighbours. Underneath the Pears – we planted 4 Hebe ,Wiri Image. They are a hardy evergreen shrub which will grow to 1m. They prefer full sun to part shade, flowering in summer with masses of violet flower heads. They have flourished against the fence facing South. In the terracotta planter boxes – (along the fence) we planted Polygala x dalmaisiana which will grow to 1.5m. They prefer full sun, part shade. A compact form of Polygala bearing a profusion of attractive dark lavender-purple pea like flowers for most of the year. They are perfect for hedges. In the planter box – (on the deck) we planted a Forest Pansy tree which has beautiful deep maroon leaves, and in spring the bare branches are covered in light pink blossom. In the wine barrels – we were kindly given as a wedding present a lemon and lime tree with all the herbs you could need underneath each. Terracotta pots – I alternate between Petunias over summer, and Pansies over winter. The large table on the deck was my brain-child, but my husbands handiwork (what a team!). 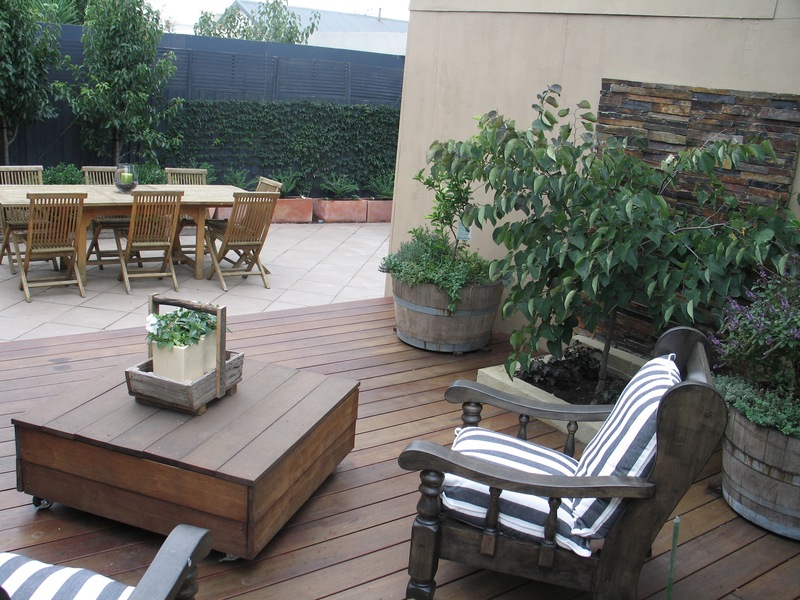 We had 2 pallets left over from the delivery of the pavers which provided the inspiration for the table. I suggested to my husband that if we (or ‘he’ as he kindly reminds me – because I won’t be doing the work) were to screw two pallets on top of each other, then cover them in the left over merbau, and attach 4 wheels to the bottom with brakes we would have a table. It has been one of the most useful items in our new garden! Since making our table I have seen a similar reuse of Pallets on another blog, resulting in a beautiful day bed. The two chairs are my footpath finds that I resurrected (read more about that project). Which have seen many warm nights drinking wine and barbecuing dinner. Again it is a great achievement to entertain in a garden you have transformed yourself. The hours of shoveling, screwing, drilling and planting have paid off. This is a wonderful idea that you & your hubby did very well & I love your finished project. Wow this just inspires me to start creating diy project. I just hope mine looks as good as yours. Wow you & your hubby Rock! You both have skills to pay the pills!